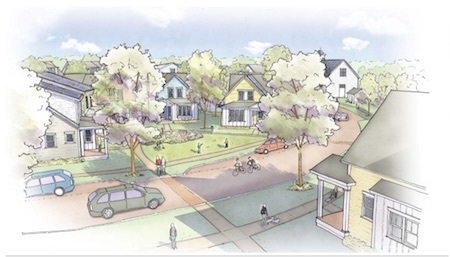 Washtenaw County has approved Veridian at County Farm, an environmentally sustainable community of up to 150 residential homes on 12.5 acres of vacant, county owned land. The project is expected to break ground in 18 months and will take two to three years to complete, pending city rezoning and site plan approval. A collaboration between Avalon Housing, Habitat for Humanity, Jonna Luxury Homes, Union Studio, SmithGroupJJR, and Biohabitats, the development will be a solar-powered, net-zero community. The community will be powered by a combination of environmentally conscious practices including a micro grid, a district-wide geothermal system, solar panels, and other green lifestyles. Additionally, 30 percent of the community will be edible landscape, and no fossil fuels or combustion appliances can be used. Veridian at County Farm’s district-wide geothermal heating system is expected to lower total energy usage by as much as 80 percent over conventional systems. The site is located in the southeast section of Ann Arbor at 2270 Platt Rd., near Washtenaw Avenue. If Ann Arbor officials grant site-plan approval, the community will consist of up to 150 residential units, including 40 percent affordable housing (townhouses, stacked flats, and single-family cottages), 34 percent tuck unders (garage below the home), 16 percent micro housing, and 10 percent cottage homes. The community will include a communal greenhouse, a farm house, a two-acre working farm, and other amenities. Joey Jonna, founder of Jonna Luxury Homes in Birmingham, says Veridian at County Farm will be a great fit for the Ann Arbor community. Jonna’s next steps include getting project approval from the City of Ann Arbor and securing financing for the project. “Our strategy here was to start with the surrounding neighborhoods and see what they wanted and what would excite them, because part of having a great neighborhood is being part of a great community,” he says.